As a big, big fan of the original Inspector Gadget cartoon, I’ve been interested in checking out the new series for quite a while, but I’ve only just got round to doing that. The show itself has already been out for nearly a year: there was a sneak preview of the first half of the first episode shown here in Australia on December 27 last year and the show premiered in France on January 3 this year. So yeah, it’s nearly been a year, but I’ve finally started watching it: thankfully, most of the series is already available on DVD here! I’ve now watched the first DVD (pictured above), so I thought I’d write my thoughts on the series thus far. Please note that I’m assuming that everyone who reads this is familiar with the original Inspector Gadget series and that my viewpoint is that of an adult fan. So what do I think of this incarnation of Inspector Gadget? I think it compares fairly favourably to the original series, as it has managed to capture the fun and humour of the original series very nicely, especially where Gadget and Brain are concerned. Some things have changed, of course. The half hour episodes are split into two separate stories (apart from the first episode), but in my opinion, the stories don’t suffer from this shortened format at all. Doctor Claw has become a bit goofy and I guess as a result of this, there is no real sense of danger in any of the missions. This is unfortunate, as this is what made the original Inspector Gadget so exciting, especially where Penny is concerned, at least for me. However, this is somewhat alleviated by the fact that Penny is now a trainee agent, which means she gets a fair share of the credit for the foiling of MAD’s schemes, although her uncle still manages to get credit when he sometimes deserves very little (if any). Another big change is that Dr Claw now has a nephew, named Talon. This works quite well, as he is the perfect foil for Penny and the relationship between Talon and Penny creates, dare I say it, some Romeo and Juliet type of romantic tension (albeit in a comedic fashion). I’ve only seen eight episodes of this new series so far, but out of the ones I’ve seen, my favourite story is called Cough Due to Claw, the second half of the fourth episode. You get to see a lot of Penny in action and it also has a hilarious moment when Penny explains to Brain, who is driving the Gadgetmobile, that she can’t drive without a licence, before warning him: “Eyes on road. Eyes on Road!”. The screenshot below is one of the action sequences from this particular episode. 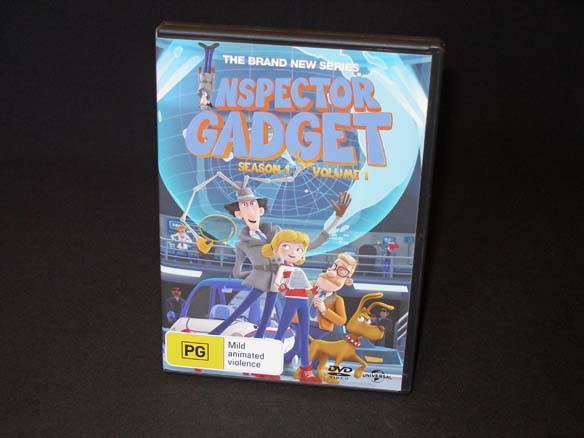 While the original series is still my favourite, I think this series of Inspector Gadget is very entertaining and a worthy addition to the Gadget franchise, so I’d certainly recommend it to fans of the original series who are yet to check it out. This entry was posted in Cartoons, TV Shows and tagged 2015, Brain, Dr Claw, DVD, Inspector Gadget, Penny, S1V1, Talon by maruserino. Bookmark the permalink.